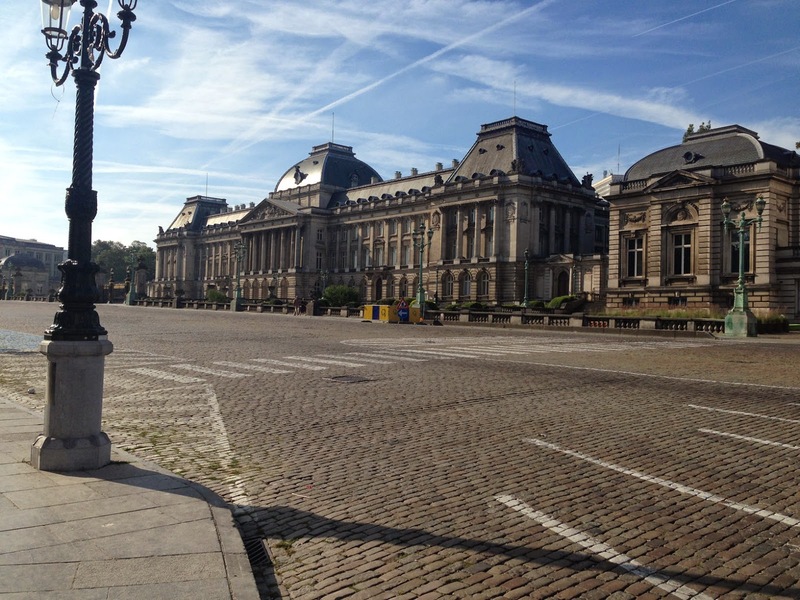 Here's a Brussels run that takes you in a loop around (and outside) the center, with its often overflowing tourist masses. 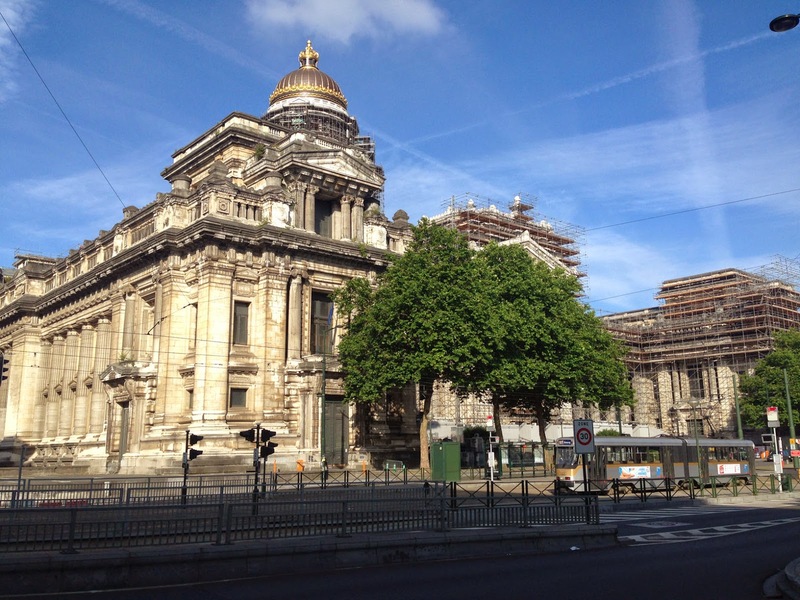 This route takes you through some of the city's interesting sights, while avoiding the crowded Grand Place neighborhood. 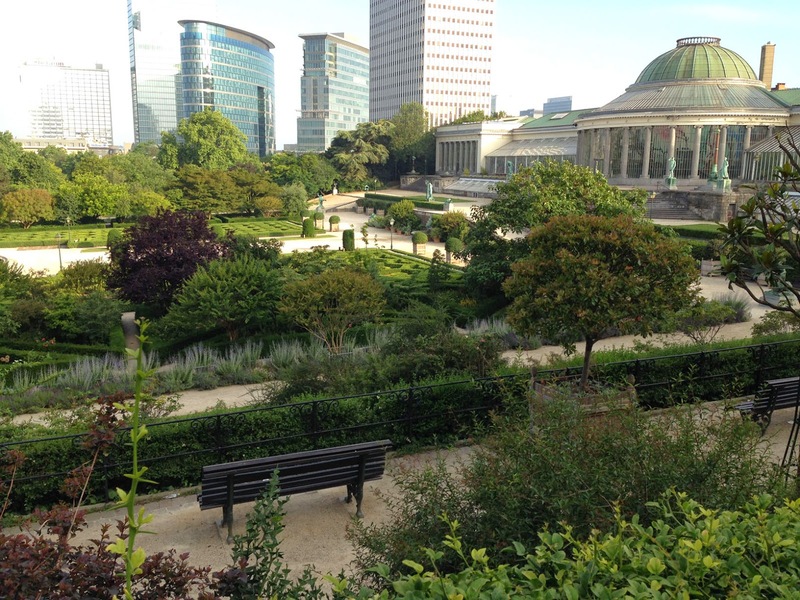 It goes through the the botanical garden, through the old harbor, sees some city wall remnants, heads up to the Petit Sablon Park, Egmont Palace and its gardens, the Justice Palace and its lookout, and then heads back past the royal palace and Brussels Park. NOTE: I'll use the French street names here, in this bi-lingual city, since most of its residents use French. No offence intended to the Flemish! There are some nice houses in-between and some ugly ones, some quiet streets and some loud ones. The whole run isn't beautiful, but it reflects the character of the city pretty well, and will give you a feeling for what the town is about. Well start up on the ridge, east of the old town, along Rue Royale. 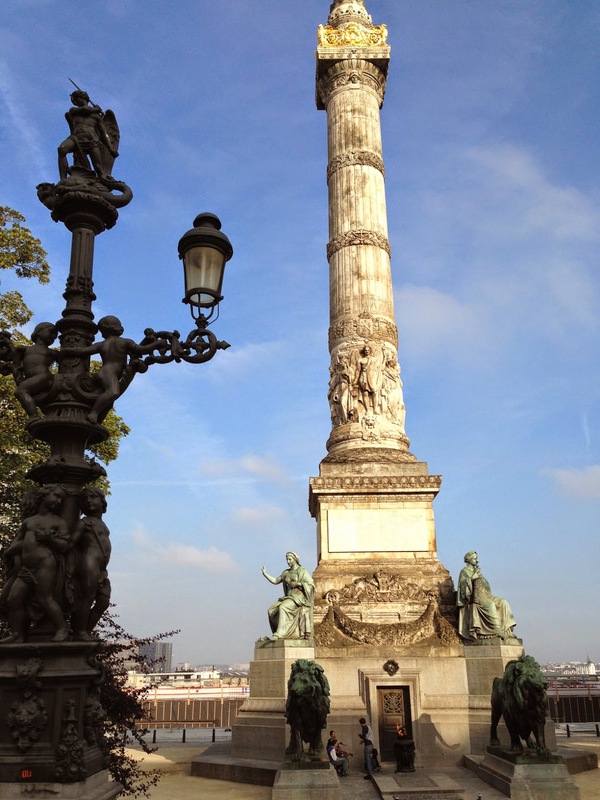 There is a square there called Place du Congres, with a column above a tomb for an unknown soldier. There is a bit of a lookout over the old town there, but you can't see much. Now, turn north and run along Rue Royale for two blocks, until you come to the botanical gardens on your left side. Follow the steps down into the park, leading to the exhibition building. Down at the round entrance of the building, take the steps down to the garden and run west through the small park. You will have to cross a little street that bisects the park. Now, run into the second section of the park, zig-zagging along the path as it descends to the lowest level of the park. You'll exit the park on the west end and continue running straight along Rue St. Lazare. Run down this side-street until it ends at Boulevard Emile Jacomain, with the trees running down the center. Turn left here and cross the wide Avenue du Boulevard at the next corner. Now turn right at the first side-street, Rue du Commercants, which is quieter than the loud avenue before it, but a bit run-down. 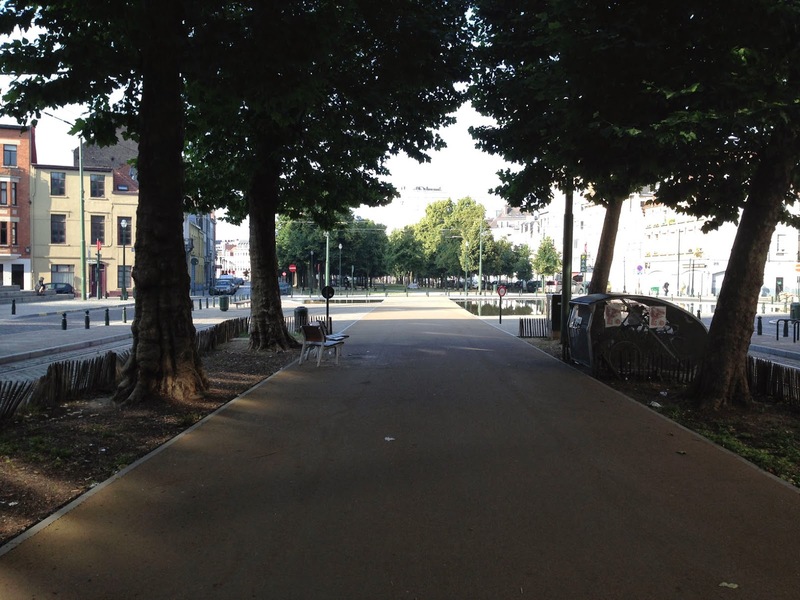 The street will end when it hits Quai du Commerce, with its tree-lined green strip down the middle. This used to be a canal which served as the town's harbor centuries ago. It was filled in, but you still get a feel for the harbor when you run down it. The street makes two bends to the left, where the old canal once stood. The last section is still a water-filled pool, lining the way towards gothic St. Catherine's church at the south end of the harbor. If you stay to the left side of the church, you'll see a remnant round-tower of the old city walls right behind it. Now turn right and run past the far side of the church to come out into a square (the old grain market) in front of the main church entrance. 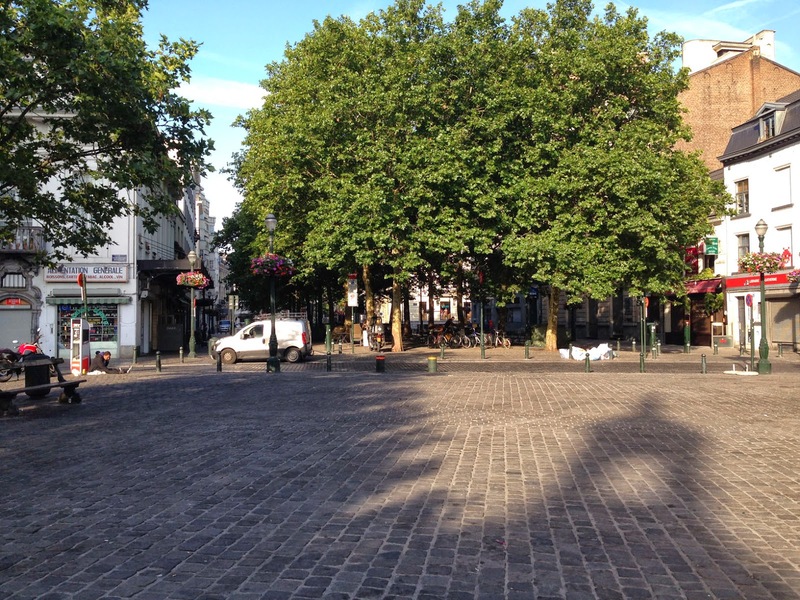 Run westwards through the tree-filled square as it gets narrower and curves to the left and becomes Rue St. Christophe. You'll come to Rue van Artvelde, where you turn right and run southwest for a block, until you come to the modern brick building. 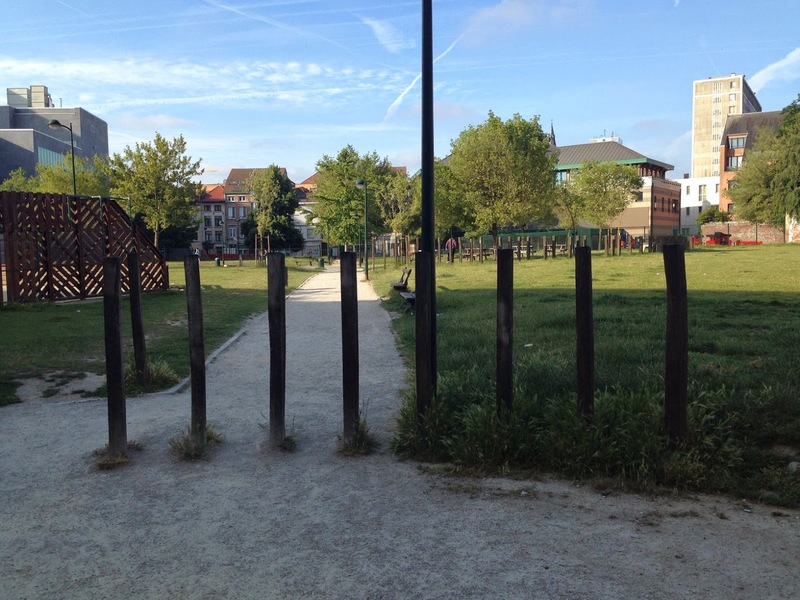 Now turn left and head southeast along Rue de 6 Jetons, which passes an ugly, uninviting park on the right side. You'll then come to an equally uninviting square called Place Fontainas, where you cross it diagonally to the right and continue running southeast along Rue des Bogards, where you now head uphill. The first blocks are not so pretty, and are lined by a hospital and other nondescript buildings. But then some nicer old buildings start lining the way. 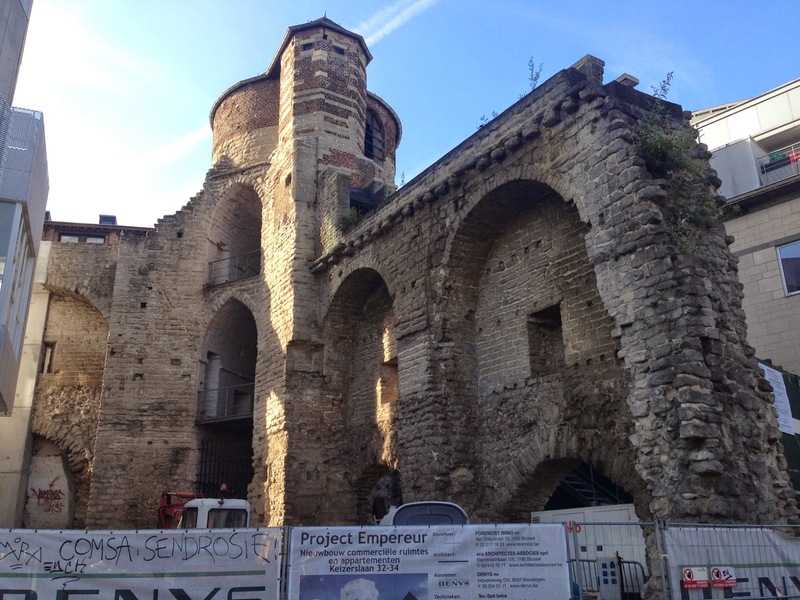 When you cross wide (but not too busy) Boulevard de l'Empereur, you'll see another short section of the medieval city wall to the left. But just keep running straight uphill. 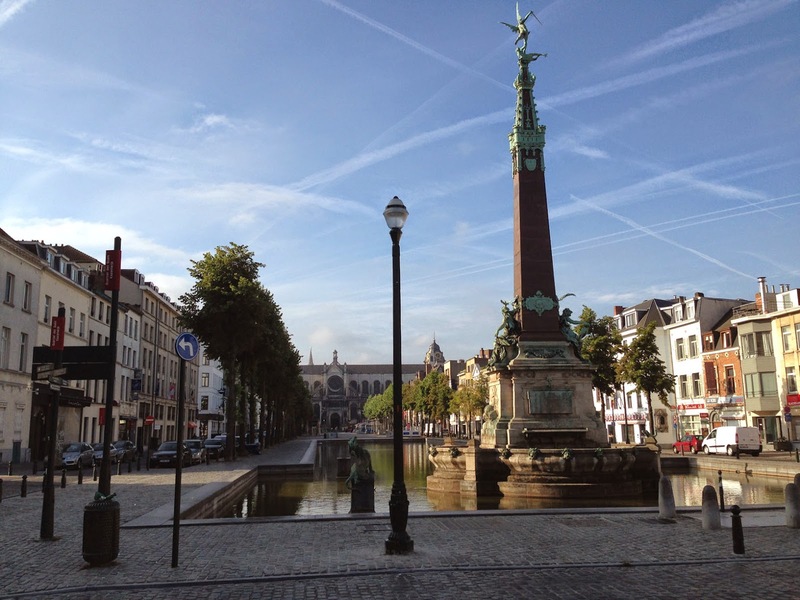 You'll soon come to a long, thin square called Grand Sablon, with a beautiful church at the far end. An antique market was happening there the last time I ran by it. 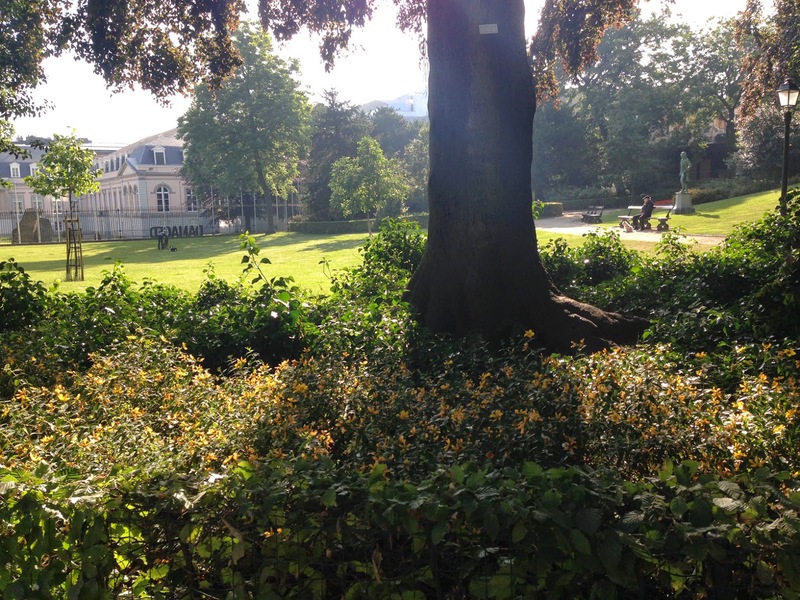 On the other side of the church, you'll come to a small jewel of a park, the Petit Sablon. It's surrounded by statues, and there are so many beautiful details that I'm fascinated every time I come by. Run up through the little park, and exit behind the statue of the two Belgian heroes who were executed for their fight for independence. You'll now be facing the gates of Egmont Palace. Turn right and run southwest on Rue aux Laines for 100 meters, then turn left through the iron gates into Egmont Gardens. Now turn right and run out the west end of the small park, passing the Peter Pan statue donated by the children of Britain to the children of Belgium after the first world war. Now turn right and get back to Rue aux Laines in just 50 meters, where you turn left and run the block to the big square in front of the looming Justice Palace. This thing is big. They really built it to impress (or intimidate). The doorways look like they were made to fit King Kong. Turn right and run to the tall war memorial on the terrace overlooking the city. Take a look out over the rooftops, then turn northeast and start running back to the starting place along Rue de la Regence. 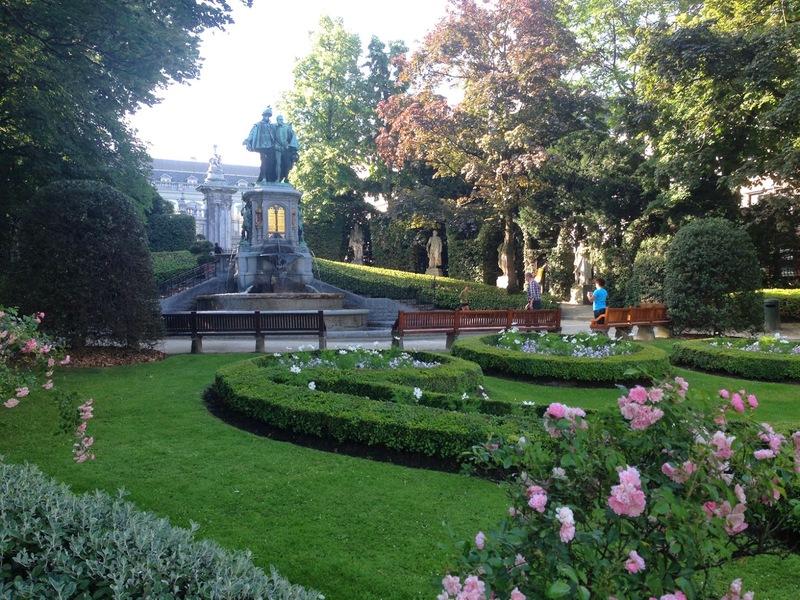 You'll pass some museums and churches, then come to Brussels Park, with the royal palace off to the right side. Run along the path just inside the park that parallels the street, which is now called Rue Royale. After the park, continue along Rue Royale for the last three blocks back to Place du Congres.